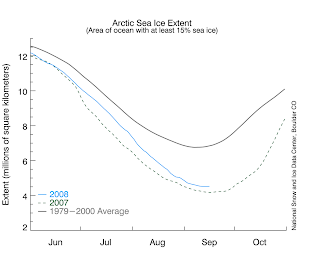 The National Snow and Ice Data Center has announced that this year's Arctic sea ice has reached a minimum extent which is second only to last year's record low. The 2008 amount is 15.0% higher than the 2007 record, but it's 33.1% less than the average from 1979 to 2000. This year's minimum extent was reached despite the fact that the current summer's temperatures have been somewhat cooler. The geographic distribution of this year's minimum ice extent was somewhat different than last year's. The opening of the Northern Sea Route, north of the Siberian coast, along with the simultaneous opening of the Northwest Passage, allowed the circumnavigation of the Arctic by sea for the first time in recorded history.